With the easing of sanctions, countries are rushing to invest, but Republicans are still caught up in a paroxysm of Islamophobia. The big Iran story is no longer congressional sniping at the deal worked out by the United Nations Security Council to monitor Iran’s civilian enrichment of uranium for reactor fuel. It is the coming gold rush of countries and companies long strong-armed by the United States to stay away from Tehran. Iran has a population of 78 million, nearly the size of Germany’s, and a gross domestic product (GDP) similar to Poland’s, a market robust enough to make any investor’s mouth water. But it also has significant future industrial potential and trillions of cubic feet of untapped natural gas, both locked up by years of sanctions and both of which could make it one of the wealthiest countries in the world in coming decades. One puzzle about the Republican Party leadership is why it wants to prevent Americans and American businesses from benefiting from a lucrative new investment arena. Even before President Obama prevailed in the Senate last week, with his Democratic Party loyalists blocking a GOP-backed resolution condemning the Joint Comprehensive Plan of Action (JCPOA), European government officials and businessmen were crowding into Tehran’s few nice hotels with memoranda of understanding in the breast pockets of their tailored suits. The great significance of the failure of Congress to block the deal is not so much that US sanctions will be rapidly lifted (the process will likely take years) but that Obama is highly unlikely to direct the Treasury Department to punish foreign firms or states that deal with Iran. The threat of those third-party sanctions had been potent, given that the United States has a $17 trillion economy and represents over a fifth of the global GDP. No one wants to be excluded from this dynamic market. Any such threat is now receding, however, and the rush to Iran is on in earnest. If Iran meets its obligations, UN-backed sanctions will begin being lifted this fall and be gone in the first half of 2016. The Iranian public, moreover, is ready for business. In recent years, some 400 modern malls have been opened, and consumers are hungry for international brands. 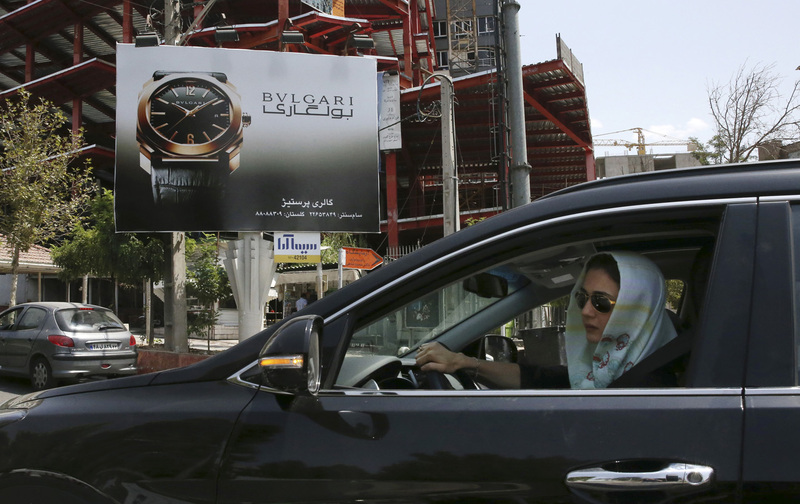 Paris newspapers crow that Iranians want “French fashion.” And boy, are Gallic CEOs ready to give it to them. French secretary of state for exterior trade Matthias Fekl noted, on his way to Tehran, that there is a strong demand for investment in “infrastructure, consumer goods, foodstuffs, transport, energy and health.” In the largest invasion of the Middle East by the French since Napoleon Bonaparte set off for Egypt in 1798, some 134 CEOs and company representatives from that country are in Iran this week, along with two government ministers. In an interview Fekl demanded that uncertainties with regard to American retaliation be completely removed by Washington (French banks are notably absent from the delegation, having been burned by the $8.9 billion fine assessed last year by the United States on BNP Paribas for flouting the Iran sanctions). Germany was more cautious than France, Spain, and Italy, but its companies and government officials are now making the pilgrimage to Tehran, as well. Iran is the biggest market for automobiles in the Middle East and had been among the major local manufacturers before its partnerships with French firms were disrupted by US sanctions. Having had its hands burned by France’s harsh policies and rhetoric in recent years, Iran now says it wants to diversify to other European firms as partners. German and Italian automakers are jockeying for that position. Japan is caught between contradictory impulses. Its current right-wing government fears getting left out of Iran’s investment opportunities, and especially of losing out to China, but Prime Minister Shinzo Abe is wary of offending the United States. Still, Tokyo is sending a delegation this week in hopes of concluding a trade agreement with Tehran. Japan imports most of its fuel for energy after the shutdown of its nuclear plants in the wake of the Fukushima disaster and so is interested in seeing Iran’s natural gas exploited. As an automobile-driving nation, it is also seeking an additional 350,000 barrels a day of petroleum from Iran, where sanctions had reduced production. As for China, it never abandoned Iranian petroleum imports to the extent that Washington had hoped, though it showed enough cooperation with sanctions to receive a pass on third-party sanctions from the United States. Now Beijing plans to upgrade its relationship with Tehran. One of the big prizes in an Iran open to global investment is its massive natural gas fields. It shares the South Pars field, estimated to hold 1,800 trillion cubic feet of gas, with Qatar, which has become rich off it while Iran was hobbled. The technique of converting natural gas to a liquid for ease of transport, or Liquefied Natural Gas (LNG), was never implemented in Iran, since only the big energy firms, such as France’s Total SA and the Netherlands’ Shell, had the know-how to develop Iran’s LNG, and they were scared off by American sanctions. Now, those gas fields will be crawling with international energy corporations. India, too, is getting into the act, with its state-owned Oil and Gas Corp. proposing a $10 billion plan to develop an offshore gas field known as Farzad B.
India also has plans to develop Iran’s Chabahar port, giving Delhi a strategic and economic foothold in the Persian Gulf. It will seek land for the port, and establish petrochemical factories there, as well as building a rail link to Afghanistan. The Chabahar project is to some degree India’s answer to China’s plans to develop the Pakistani port of Gwadar near the Iranian border. The dueling port development projects by the two Asian giants mentioned above signal that Iran and the Gulf are becoming the arena for a new Great Game. In the 19th century, British India and Tsarist Central Asia were bases for Anglo-Russian competition over Iran, Afghanistan, and parts of Central Asia. If Iran is likely to be at the center of a new Great Game, those countries that win it will have gained a new economic and political asset of some worth. The United States and its workers and companies seem likely either to sit this one out or to be so late to the party that they won’t be serious players. The Republican Party, in past decades known as the party of business, seems ready to sacrifice a new potential El Dorado on behalf of its current paroxysm of Islamophobia.